On Sunday, October 22, 2017 Their Royal Highnesses Crown Prince Alexander and Crown Princess Katherine attended a Patriarchal Divine Liturgy officiated by His Beatitude Patriarch John X of Antioch at the Saints Peter & Paul Antiochian Orthodox Christian Church in Potomac, Maryland near Washington, DC. The Patriarch is on a visit to the Antiochian Orthodox Christian Archdiocese of North America which includes nine Dioceses containing over 275 cathedrals, churches, and missions throughout the United States and Canada. Importantly, His Beatitude is also in the Washington, DC area to meet with the leadership of the United Nations as well as members of the current administration of the United States to: 1) promote a peaceful solution to the Syrian crisis; 2) highlight the current humanitarian crisis; and 3) discuss the future of Christians in Syria and the Middle East. His Beatitude will also be an honored guest at the “In Defense of Christians” Summit in Washington, D.C., from October 24–26. The Summit is titled "American Leadership and Securing the Future of Christians in the Middle East." Concelebrating at the Patriarch Divine Liturgy with His Beatitude were His Eminence Metropolitan Joseph, Archbishop of New York and Metropolitan of all North America, and His Grace Bishop Alexander of Ottawa, Eastern Canada, and Upstate New York of the Antiochian Orthodox Christian Archdiocese of North America, and His Grace Bishop Irinej of Eastern America of the Serbian Orthodox Church. Also joining in the celebration was the Very Reverend Protopresbyter Aleksa Micich, together with his flock from the St Luke Serbian Orthodox Church in Potomac, Maryland. Among the dignitaries present were His Excellency Djerdj and Mrs. Vera Matkovic, Ambassador of Serbia to the United States of America. The morning started as the children of St. Luke Sunday School greeted both Bishop Irinej and the Royal Couple, dressed in traditional Serbian costumes. The children sincerely appreciated the opportunity to greet their Hierarch and the Royal Couple as they entered the church. During the Liturgy, Patriarch John X spoke movingly of the dire situation of the persecution of Christians in the Middle East and the need for us in the United States to remember our Orthodox brethren there in our prayers always. His Beatitude also referred to the difficult situation for many Serbs in their Homeland. At the conclusion of the Liturgy, a Memorial Service was offered for the Rt. Reverend Bishop Antoun and V. Rev. Protopresbyter George Rados, both of the Antiochian Orthodox Church, and both who recently departed this life. After the Divine liturgy, the Royal couple were received by Patriarch John X and Antiochian Metropolitan Joseph, together with His Grace the Right Reverend Irinej, Bishop of Serbian Orthodox Church Eastern America Diocese. 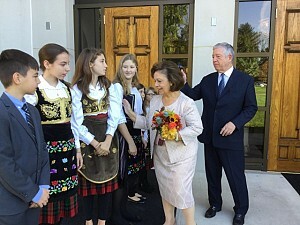 The Royal couple also met with members of the Saint Luke Serbian Orthodox Church in Potomac who attended the Patriarchal liturgy. The Royal couple were accompanied by The Honorable Mr. and Mrs. Branko Terzic, Royal Adjutant and member of the Privy Council. Њихова Краљевска Височанства Престолонаследник Александар и Принцеза Катарина присуствовали су Светој литургији коју је служио Његово Блаженство Патријарх Јован X Антиохијски у Антиохијској православној цркви Светог Петра и Павла у Потомаку у Мериленду. Патријарх је тренутно у посети Антиохијској православној архиепископији Северне Америке која обухвата 9 епархија са више од 275 цркава и катедрала широм Сједињених Америчких Држава и Канаде. Након литургије, Његово Блаженство Патријарх Јован X Антиохијски угостио је Њихова Краљевска Височанства у парохијском дому, заједно са Његовим Преосвештенством Иринејом, Епископом источноамеричким, као и Антиохијским Митрополитом Јосифом. Краљевски пар се на литургији састао и са члановима српске православне цркве Свети Лука у Потомаку. Њиховим Краљевским Височанствима на литургији се придружио и господин Бранко Терзић, Краљевски ађутант и члан Крунског већа, са супругом.